Nottingham Daily Photo: "Look, I'm Sure The Castle Is Around Here Somewhere?" "Look, I'm Sure The Castle Is Around Here Somewhere?" "Yes ladies, it's right behind you!" I was out for a photography stroll with a workmate at lunchtime today, as he wanted to have a go with my Olympus EM-1, as he is thinking of getting one. He currently uses a Fuji X-10, but he says that he's not happy with it. So we had spent some time in the Old Market Square, where he took various pictures and had a feel of how the camera feels in his hands. He was quite impressed. 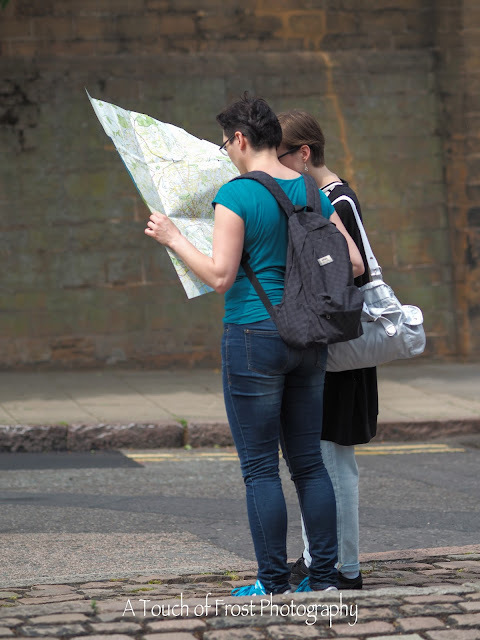 We had made our way to the castle area of town, when I saw these two ladies, standing with possibly the biggest map of Nottingham that I've ever seen. I know the city centre is quite big, but I don't think you would need a map that big to see where all the streets and attractions are. It is hardly London or New York. Fortunately I had been given my camera back by the time we got to the castle, so I was able to capture this scene for today's blog post. I wonder if they ever found what they were looking for?